If you don’t have a lot of experience with microphones, it’s particularly important that your mic is easy to set up. While having a ton of settings gives you control over your recording, too many knobs might be confusing in the beginning. On the other hand, you might appreciate more control settings if you’re a more experienced microphone user or are more ambitious with your sound. With “design”, I don’t mean looks (although I will talk about looks, too). Instead, I’m talking about how the microphone is built (which materials, which shape, etc.). A cheaply designed microphone might be less sturdy or could be more prone to accidents. It might also be less practical or harder to work with. Obviously, audio quality is one of the most important factors when it comes to buying a microphone. You want a full, balanced sound and as little noise as possible. Every microphone has at least one so-called polar pattern. The pattern tells you where the mic is the most sensitive. A cardioid mic, for example, is mostly sensitive in the front, which makes it perfect for YouTubers and podcasters. An omnidirectional pattern, on the other hand, is sensitive in every direction. This means it will record noise behind the mic just as well as in front of the mic. Many microphones allow you to choose between multiple polar patterns, which can be an advantage in some situations. While most traditional XLR microphones don’t come with a stand, many USB mics do. Table stands can be super convenient for any podcaster or YouTuber, because it means that you don’t have to buy and set up a boom arm or other type of mic stand. However, not all stands have the same quality and some can be more convenient than others. So, let’s get to the reviews: What’s the best USB microphone for YouTube? We’re going to look at 5 popular and highly rated mics. 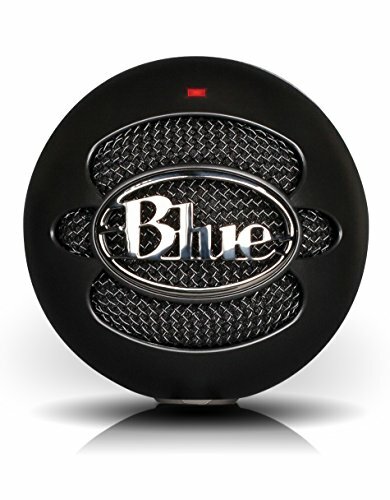 Blue is a well-known brand among YouTubers, thanks to their line of quality USB mics. In this review, we’re going to look at the Blue Snowball iCE. Thanks to its vintage design, it looks good on any desk and in any video. It has only one polar pattern (cardioid), but that shouldn’t be an issue for most YouTubers. The Blue Snowball iCE is super easy to use. Connect it via the included USB cable and it works. Since there aren’t any switches or controllers on the mic, you can’t do anything wrong. The Blue Snowball iCE comes with a small desk stand (just like the Blue Yeti). This means you can put it on your desk and start recording. No need to buy and set up a mic stand first - great! Enter your text here...While the Blue Snowball iCE is well designed, it can be fairly easy to knock over due to its big “head”. The good news is that this microphone is sturdy enough to take a few hits. The sound of the Blue Snowball iCE is smooth and pleasant. With a little bit of post-processing (EQ, compressor, limiter), this microphone can sound quite professional. Compared to higher priced mics, the iCE lacks a little bit in clarity and it tends to pick up unwanted background noises. The audio quality also drops quite a bit when you move away from the mic. So if you move around a lot, this might not be the best microphone to choose. Attention: Don’t confuse the Blue Snowball iCE with the Blue Snowball. While the iCE is cheaper and only offers one pick-up pattern, the Blue Snowball is more expensive and offers three to choose from. Although having three options can be practical, you’ll most likely only need one pattern anyway (cardioid). An exception could be if you want to record audio from multiple people in the same room. In that case, the Blue Snowball might be a better choice, since it also offers an omnidirectional polar pattern. You can get the Blue Snowball here. Conclusion: If you’re on a low budget, this is a great mic to get! The Blue Yeti offers a lot of control directly on the mic. Not only are you able to choose between four polar patterns (cardioid, bidirectional, omnidirectional and stereo), you also have access to a gain control, a mute button and a headphone output. These controls will help you create perfect conditions for your sound before you hit the record button. Like the Blue Snowball, the Blue Yeti comes with a stand. And what a stand it is! While it is certainly aesthetically pleasing and offers stability, it will take up some space on your desk. If you don’t have a lot of room, you can also place the Yeti on a boom arm. Here are a few good boom arm options for the Blue Yeti. Thanks to its sturdy stand, the Blue Yeti stands safely and is quite stable. One area where you need to be careful is the knobs. These can get loose when you use them a lot. A disadvantage of this mic is that it’s very heavy. This means that if you decide to get a boom arm, you will have to pay more to get one that can hold the weight well. 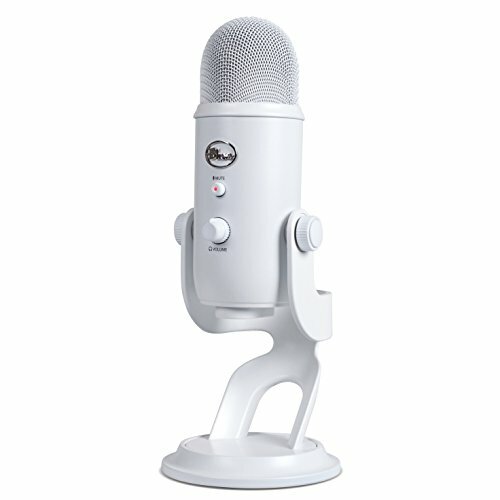 The Blue Yeti’s sound quality is impressive, especially compared to other mics in its price range. It sounds full and pleasant and although it is sensitive, it’s not prone to picking up background noise. Conclusion: The Blue Yeti is pretty much the gold standard of YouTube microphones. You can’t really go wrong with it. It’s practical, offers great sound quality and is still affordable for many YouTubers. Its multiple polar patterns will make this a great mic for any occasion. The Samson Meteor is a convenient and affordable cardioid microphone that comes with an interesting design. It is available in a titanium black and a chrome version. The Samson Meteor is easy to use and even offers a few controls like a mute switch, a headphone output and a headphone volume knob. Samson came up with a pretty clever idea for the stand: The three legs are directly attached to the microphone and can be folded in if you want to use a different mount. What’s especially convenient about the legs is that their angle is flexible. This means you can easily position your mic in the most optimal way. Even smaller than the Blue Snowball, this is the most convenient microphone to take with you if you travel a lot. Thanks to its foldable legs, you also don’t need to reserve any extra space for a stand. Perfect! While it’s certainly smart to integrate the stand into the mic, one of the legs unfortunately covers the USB and the headphone input when it is folded in. This means you will have to keep the leg folded out when you want to use a different mount. Other than that, the Samson Meteor feels solid and makes a stable impression. What I love about the Samson Meteor is how clear it sounds. In fact, you can see in the test above that it sounds fuller and more present than the Blue Snowball does. However, it can also sound a little harsh compared to the Snowball. Like with other microphones, the Meteor sounds best when you’re closer to it, which can be tricky because of its small size. So if possible make sure to set this up relatively close to you. Conclusion: Pick the Samson Meteor if you travel a lot or if you need a budget-friendly microphone with decent sound quality. Now we get to a mic that looks and sounds more like a studio microphone. Unlike Blue and Samson (which are more focused on consumer electronics), Audio-Technica has been producing professional studio microphones for many years. The mic we’re looking at today, the AT2020, has been around for many years as an XLR microphone. Due to its popularity it was released as a USB microphone a few years ago. How does it hold up? While not offering a ton of controls, the Audio-Technica AT2020USB+ comes with mix control and headphone volume control - both helpful features. Although the AT2020USB+ comes with a stand, it is not only slightly awkward looking, but it is also not that stable. This microphone clearly wasn’t designed as a USB microphone. That doesn’t mean it’s bad - it just needs a different stand (for example the RODS PSA1 Swivel Mount). This microphone is clearly more of a studio microphone - and that’s what it looks like. This also means that it’s not the most convenient one to travel with. However, it is well-built and it will likely last you for many years if you treat it with care. The Audio-Technica AT2020USB+ sounds very professional and clear; it beats the Yeti noticeably in the higher frequencies. That said, I found that there can be a slight harshness in s-sounds. Depending on your type of voice, you might want to adjust that with an equalizer. Also, if you’re a musician, this might be the best-sounding mic on this list. Conclusion: The Audio-Technica AT2020USB+ is one of the more high-end microphones on this list - and that’s exactly what it offers: high-end quality. If you’re looking for better than the standard, you should at least consider the Audio-Technica AT2020USB+. However, if you choose this microphone you will likely need to buy a different stand. Although the Shure MV5 is relatively small, it offers a lot of valuable controls. The headphone output and headphone volume control will help you monitor your recording. The mute button is great for getting rid of coughs or other unwanted sounds during the recording, however it is a little hard to access, since it is on the bottom back of the microphone. Another helpful control feature is the DSP modes. I’ve written more about this in the sound quality section below. One of the highlights of the Shure MV5 is the stand, simply because unlike some of the other mics I’ve reviewed, the Shure MV5 can be used with or without the stand. This also means that this microphone is easy to travel with (although it’s recommended to put the microphone into a protective box). The stand itself is unfortunately pretty lightweight, and while that might be good for travelling, it is very easy to knock over the mic. The exterior of the MV5 is almost all plastic. However, the plastic seems pretty durable and many users have reported that the microphone still looked like new after knocking it over multiple times. Since the Shure MV5 is pretty small even with the stand, it can be hard to achieve the optimal recording position without leaning forward. If you don’t want to worry about your position as much, you can also put the MV5 on a different stand (for example, a boom arm). Like I mentioned, the MV 5 has 3 DSP modes that you can choose from - but what does that mean? DSP stands for digital signal processing and happens to be a pretty complicated topic. You only need to know this: The Shure MV5 has three DSP modes that are optimized for different sound sources, which means they’ll create a slightly different sound. The MV5 offers a vocal mode, a flat mode and an instrument mode. One benefit for iOS users is that the Shure MV5 can be used with the free ShurePlus Motiv app. This app lets you adjust many settings, including sample rate, DSP modes, compressor, equalizer, limiter and mic gain. Which USB microphone should you get? It really depends on your budget and needs. Both the Samson Meteor and the Blue Snowball iCE are good budget-friendly options. However, if I had to pick a winner, I would choose the Blue Yeti. Not only does it sound good, it is also well built and offers a lot of control on the mic that will make your life as a Youtuber or podcaster easier. Get the Blue Yeti here. Now, if you don’t need as many controls and want something with an even more present sound, the Audio-Technica AT2020USB+ might be a good alternative to the Blue Yeti. What’s your experience with microphones? Let us know in the comments what microphone you currently own and if you’re happy with it!